Creating your own cake plate stands is as easy as looking in your cabinets or hitting your local thrift store. 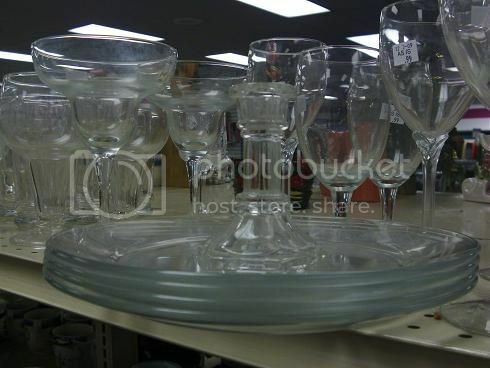 Every single thrift store has a glass wares aisle and mismatched, miscellaneous items are their specialty. Look closely at what constitutes a pedestal cake stand in my picture below – any kind of plate and a candle holder. Do you see what I found at the Orlando Goodwill? Prices to sell at $0.99/piece, I mixed and matched glassware to create a custom look for any themed gathering. I felt like a kid in art class having such fun with food coloring. Use just a drop of food coloring in a small vase before putting your plate on top. This is a quick and easy idea too add oomph when you’re entertaining for a special occasion. As you can see, it’s not just about showcasing dessert entree’s on your cake plates. The sky is the limit. It’s very easy to make these cake plates permanent by adding a strong bonded glue to the bottom of the plate/candle holder. I’ve used upside down bowls and plates for varying sizes, layers, and looks. When you open up that cabinet, have fun experimenting. You may be surprised at the fun you’ll have. I just found this exact wooden cake plate at a thrift store for $2. I was planning on spray painting it some fun teal color until I saw this picture. And everyone has to appreciate my bedlam decorating picture. Please send me your pictures if you try these. I’d love to show them on here. Great ideas!! Have a great week! Blessings!!! Great post. I just posted today on my Valentine Tablescape which was pretty much all done with yard sale and goodwill finds. Simple yet pretty. I love the wooded cake stand too, it would be VERY pretty in the Fall. This is great! My friend has been collecting random glass pieces from yard sales for the past few years. She plans to put them all together for the table settings for her wedding. Every table will be different! Y’all are so creative!!! What an awesome idea. I’ve seen this but have not tried it yet. Can you show or tell what kinda plate and bottom you used to make the plate holder with the cake with candles on it. That is very pretty, they all are. I would have never thought about trying that. I feel like spring is a ways off for us, tonight ( Thurs.) we are waiting on the storm to hit tonight and Fri and Friday night then round 3 starts Tues. It has been awhile since I have seen weather like this here in NC. Love it! I have made a few of these from thrift store plates and candle holders, gave some away as Christmas gifts. Here is a post that shows 2 of them and how to make your own glass cloche to go on top! What great ideas! I am going to try it myself! The idea of adding water and food coloring is so creative. Hey girl! These are so much fun! What great, simple, frugal ideas!! Wow! 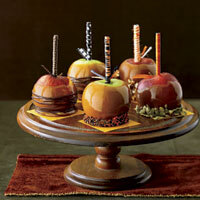 Great ideas and suddenly, I’m hungry for cake and candy apples. Great ideas! You have the most inspiring ideas and I can actually afford to try them! I’m really enjoying your site! I love this idea! Elegant. I really love the easy storage of something that could – if permanently put together – be very bulky and difficult to store! And I’m a thrift store girl myself, and I also live in in Central Florida – East Orlando. Wonderful! Thanks for sharing these ideas. How do you store all the different decorating dishes and items you have found when you are not using them? Do you have a separate shelf space in your basement? The other question is : how do you decide when to say “enough” of something. I find i can get carried away and even “deals” can take too much budget or occupy too much space/clutter. Just curious about how others balance this creative pull with space/time/$ issues. I love the website and the encouragement. You have no idea how much it has helped me – especially in the frugal wardrobe area! thanks for sharing. LOL I thought those were nuts in the that last picture. You fooled me. My friend, Lisa, has been on the lookout for a cake pedestal…I may just have to make her one like those! Great ideas, Jen! WOw! Those are georgeous! 😀 Great ideas! I love the idea of spraying the wooden one a teal color! Pretty! But I agree, wait until after autumn! These are such great ideas! Our daughter is getting married and her Dad was hurt in a coal mining accident and is unable to return to work so we need all the beautiful things at very cheap prices for her wedding. Please keep posting because I’m loving it all! Love creating. I am almost 70 and still get relaxation from creating. Love your ideas. Thank you for sharing. Thank you, Vickie. What are some of the things you like to create the most?